We will be starting our 2014 Block of the Month (pieced) program in April. 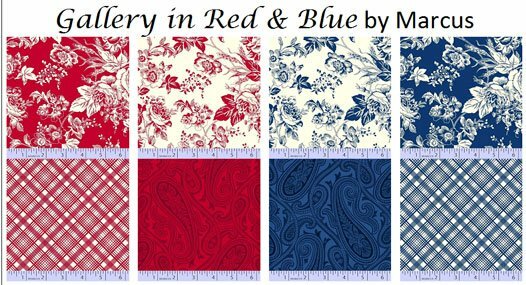 We've selected a Marti Michell quilt, Anniversary Waltz, pictured. Many of you are familiar with Marti's templates. We did one of her quilts a few years ago, and the same templates are used for this quilt (B&D). The quilt is made with twelve 12" blocks set on point. 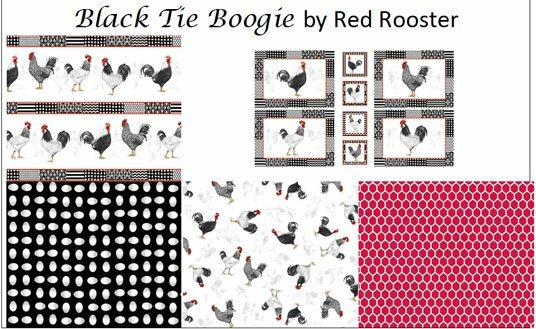 Our color scheme is black and white with touches of red. The finished size is approximately 85" x 105". A sample block is on the left. Sheila Bayley will be giving the demonstrations, and they will be on the first Thursday of each month at 10:30-11:30 a.m. and 5:30 - 6:30 p.m. The cost to register is $100, and this includes the first month's block and the finishing kit (which will be distributed at the end of the program). The monthly cost for the next 11 months is $25. We are taking registrations now through March 21. 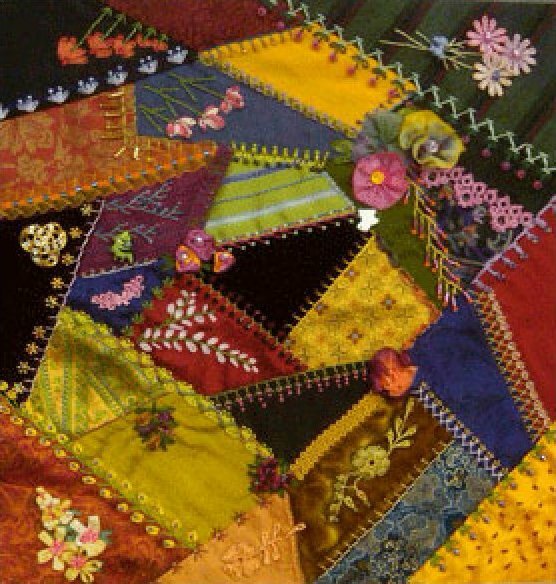 The 2014 Foothill Quilt Show, "Glorious Foothill Flowers", is Sat-Sun, Mar 22-23, at the Gold Country Fairgrounds, Auburn. There are over 300 spectacular quilts and wearables, 40 vendors, and a Country Store. The special guest quilter is Velda Newman. Enjoy quilting demonstrations, fashion show, door prizes, raffle baskets, and lunch at our cafe — there's something for everyone. Remember, the Eleanor Burns Trunk Show will continue through the end of this month. 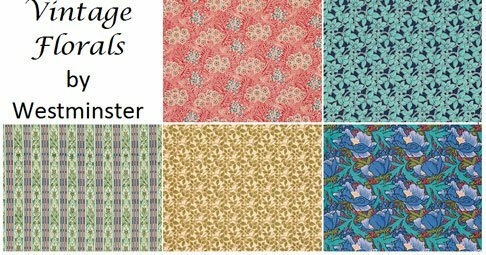 Well, it's been a few weeks since the last newsletter, and we have received LOTS of new fabrics. In addition to those pictured below, we've added to our batiks, color wall, kids fabrics, silk dupionis, minky prints, and rayon batiks. We also have new buttons and ribbons. 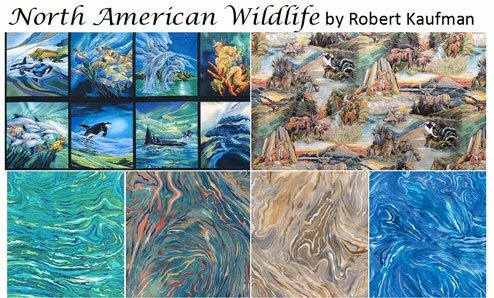 Continuing with the animal theme, we have North American Wildlife from Robert Kaufman and some gorgeous coordinating prints. You really have to see these in person to appreciate the depth and textural quality of these fabrics. 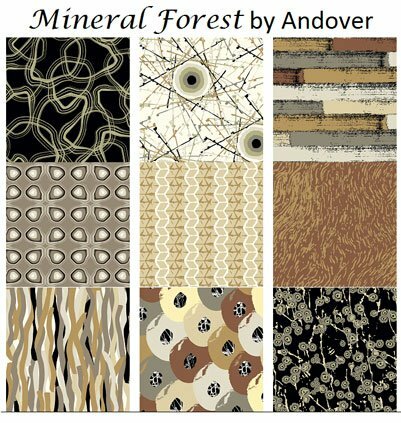 Now switching from fauna to flora, we have Mineral Forest by Andover-Makower. This is a contemporary line inspired by the patterns and textures in rocks and minerals. Another contemporary (and somewhat wild!) 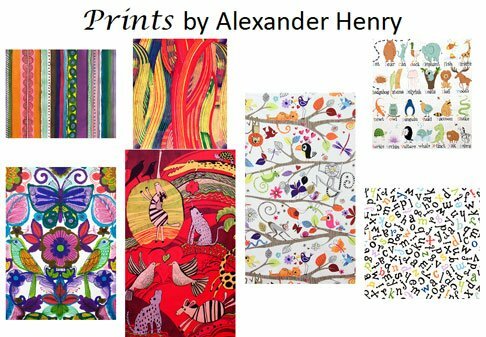 group of prints has arrived from Alexander Henry. 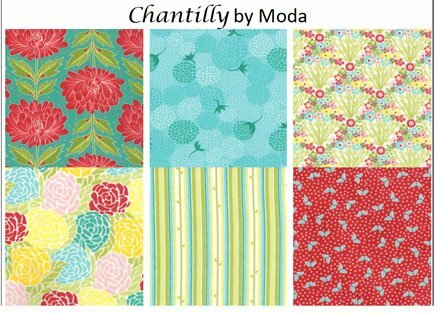 Calming things down a bit, here's Chantilly from Moda. We have an adorable little girl's dress and a gorgeous, fun quilt made from this collection on display. 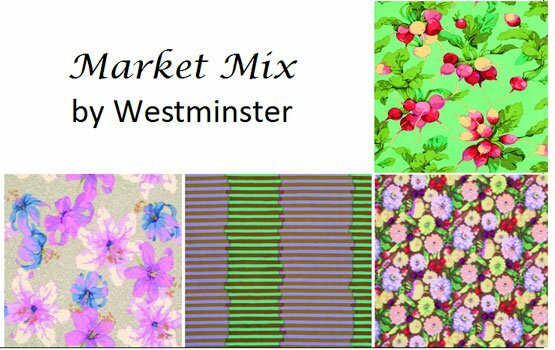 From Westminster, we have Market Mix another contemporary group, and Vintage Florals, a selection of prints reproduced from the Victoria and Albert Museum's fabrics. These prints are from the late 19th and earlier 20th century. And last of all, a very pretty traditional collection from Marcus Brothers. In our last newsletter, we showed you Le Petit Bistro, a coffee-themed collection. 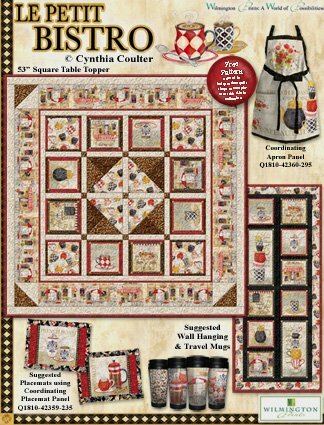 We now have the table topper from this collection on display, and we've made kits, too! Blankets for Preemies, Fri, Feb 21, 11:00 a.m. - 3:00 p.m.
American Girl Doll Sit & Sew, Wed, Feb 26, 1:00 - 4:00 p.m.
Beginning Crazy Quilting, Toni Jordan, Sun - Feb 23, 11:00 a.m. - 3:00 p.m.; Mar 2, 11:00 a.m. -1:00 p.m.; Mar 9, 11:00 a.m. - 1:00 p.m., $60, supply list. In the first session you’ll construct a 14” block using a wide variety of fabrics; cottons, silks, tapestries, velvets, linens… In the second session you will start the embellishments. You will learn a variety of embroidery stitches using different threads and techniques. 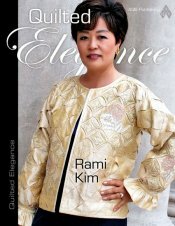 In the third session, you will learn more embroidery stitches and embellishment techniques using buttons, laces, jewelry and other “finds”. 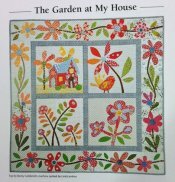 Hexie Garden Quilt, Sheila Meehan, Fri, Mar 7, 10:00 a.m. - 11:00 p.m., $40, supply list. 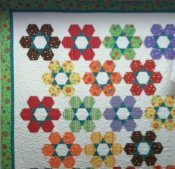 Come make this fun, scrappy quilt and learn a method that makes sewing hexagons easy. There are no set-in seams! 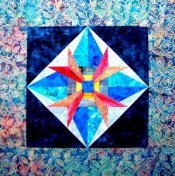 Foundation Paper Piecing, Dana Lahargoue, Thu, Apr 24 & May 1, 5:30 - 8:30 p.m., $40, supply list. Come and learn this traditional quilting technique that produces perfect blocks, even with small pieces! 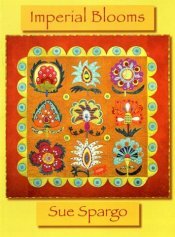 The class project will be "Rays of Hope" by Carol Doak, which can be made into a pillow or wall hanging. Thu, Apr 10 & Apr 17, 5:30 - 8:30 p.m.